Gary Hodges of Joystick Division called me over the weekend with some questions. This week he’s publishing the results in three installments. I was very impressed and flattered by the amount of research he’d apparently done. Part 1 is here, and concerns my upbringing. Part 2 is here, and concerns Braid. Part 3 is here, and is of grave concern to all. 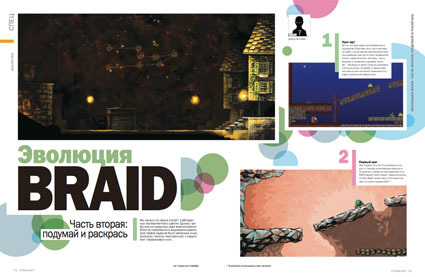 Russian gaming magazine Strana Igr continues to publish The Art of Braid in Russian. With permission from the editors, here are the first three installments. Today’s 1UP FM podcast is an extended conversation between Nick Suttner and Shawn Elliott of 1UP, Rod Humble of The Sims and The Marriage, and Jonathan Blow and me of Braid. It’s quite long and I haven’t listened to the whole thing yet, but what I did review seemed pretty good! You can also subscribe to 1UP FM via iTunes. UPDATE: An outline with time signatures has been written by Ben Zeigler at his blog, Double Buffered. It’s a nice reference. At the end, Ben falls asleep. This has been up for a little while, but it was just brought to my attention last night when I met Matt Keil, Wade Beckett and Adam Sessler. Happy birthday to Adam!